Amanda Ross is on a school trip to Taos, New Mexico with several of her fellow creative students. Join Amanda, Cleo and their funny friend, Caleb, as they visit an ancient and beautiful landscape where a traditional hacienda, an ancient pueblo, and a haunted and spooky hotel all hold secrets to a wild and violent past. Does Cleo really see ghosts? Can Amanda escape the eerie wind that follows her everywhere? 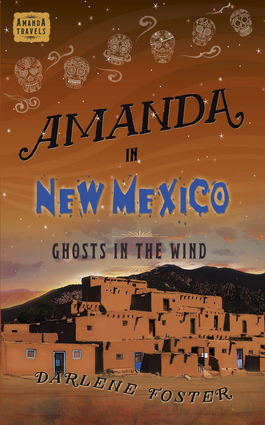 Perhaps the Day of the Dead will reveal the mysteries of Taos in this latest adventure of Amanda's travels. Darlene Foster is an award-winning author and world traveller who spends her time in Vancouver, Canada and Orihuela Costa, in Spain.